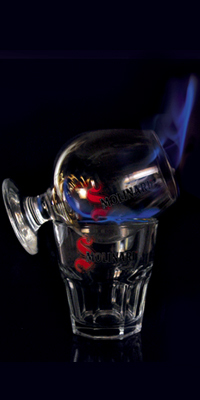 Pour Sambuca Molinari into a balloon glass, add coffee beans and put a match to the mixture. Put balloon glass on old-fashion glass (whisky glass) and turn it round for about 30 seconds to make coffee beans release some essential oil. Thereafter empty Sambuca into old fashion glass and cover with balloon glass to put out the fire. Put balloon glass of a napkin and drink Sambuca in one shot biting coffee beans therewith. Maximum effect can be achieved if to turn balloon glass up together with napkin, pierce it through with a sipper and inhale fumes from the glass.